Sound Off!!! It's Silhouette School Survey Time! I need your help! Around this time last year I asked for your help with a Silhouette survey and only about 10,000 of you weighed in. Apparently you have some opinions you want heard. I mean...WOAH! Now I need your voice again! I have 10 quick questions for you...about your crafting habits, where you like to spend your craft fund, and a few other things like software, selling, and sublimation! Of course the purpose of our surveys is always to use the results to hopefully be able to bring you better tutorials, products, projects, and partners so your opinion is hugely important to us! By the way...for those of you STILL waiting on if your opinion about the need for a bigger Silhouette cutting machine helped push Silhouette that direction, I can tell you I put all 10k of your opinions and feedback into a big ol' report and presented it to Silhouette execs last spring. They are listening, but this stuff doesn't happen over night. However... I'm excited we will have an answer VERY soon...and you'll hear it on Silhouette School first! 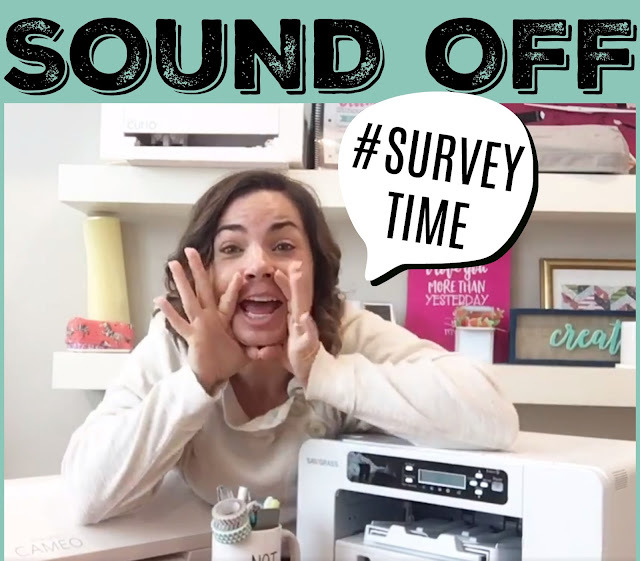 In the meantime, if you have 3 minutes, I'd love for you to share your voice in this year's survey...because believe me you never know who's listening! !